Powers/Abilities: A cruel and power-hungry man, Colonel Faroun displayed no paranormal abilities, but was skilled at horsemanship and piloting an airplane (...and considering his rank/title, he probably also had military experience). Faroun was armed with a handgun and a scimitar. 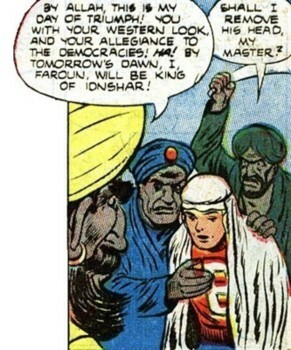 History: (Man Comics I#26/3 (fb) - BTS) - The past of Colonel Faroun is largely unrevealed, but he was angered when his nephew -- the king of Idnshar -- married an English woman; their union produced a son -- Iba-Taub -- whom Faroun disliked because he thought the blond-haired boy didn't look like an Arab. When the king died, young Iba-Taub inherited the throne and became ruler of the country. But Iba-Taub was friendly with the Western democracies, so Faroun was determined to have him dethroned and rule in his stead, then he planned to ally with the Soviets and aid them in conquering the world. Colonel Faroun began to covertly foment a rebellion amongst some of the citizenry to overthrow Iba-Taub's reign. 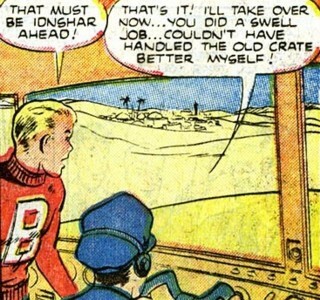 (Man Comics I#26/3) - Mr. Brant was on a mission for the United Nations to ease the political unrest in Idnshar, and he took his son Bob with him -- he even allowed Bob to bring along his friends since it was during a school vacation. 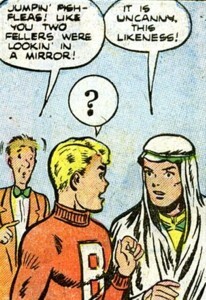 Bob and the Trouble-Shooters were walking through the local bazaar when they ran into another American, tractor salesman Willy Wonder, and Willy's customer, the teenage King Iba-Taub -- Bob and the king were both startled by the uncanny resemblance they shared. Suddenly, Iba-Taub's loyal palace guards came running up to warn him that Faroun's rebels were about to strike, and they hastened the young king off to safety. 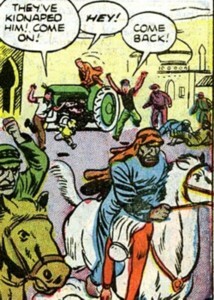 But when the rebels came riding up on horseback, they mistook Bob for Iba-Taub, then knocked him out and carried him off to Faroun's fortress. 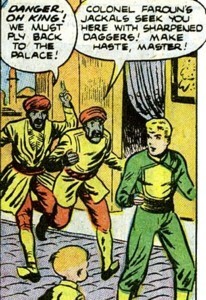 When they arrived at the fortress, Faroun himself mistakenly believed Bob was his great-nephew and ordered him to die in agony in "the dungeon that shrinks" (wherein the floor slowly moved upward to the ceiling, thus crushing those imprisoned) -- with the "king" dead, Faroun figured Iba-Taub's faithful palace guards would wilt before the fierceness of the rebels, then the throne would belong to him, so Faroun ordered the rebellion to begin. 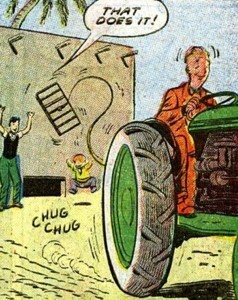 As his prison-cell's floor slowly rose to meet the ceiling, Bob feared he'd be squashed like a fly; but in a nick of time, Bob was freed by his three buddies and Willy Wonder when they used Willy's tractor to pull the bars from the dungeon window. The boys and Willy secured a log across the front of the tractor and used it as a battering-ram to sweep the rebel insurgents from the streets -- when they saw Bob, the rebels were frightened by what they thought to be King Iba-Taub's ghost. Willy, Bob and the Trouble-Shooters drove on to the palace, and Iba-Taub charged out to lead his own men in a counter-attack -- the rebels were further terrified by what they now thought to be two ghosts of the king! Faroun's rebellion soon crumbled, and Faroun and his men fled the city on horseback to his private plane near Dervish Oasis -- but Faroun didn't know that Willy, Bob and the Trouble-Shooters were pursuing him on Willy's tractor. Upon reaching the oasis, Faroun ordered his henchmen to hide in the desert, while he would fly off to recruit other tribesmen, then he would return to continue the rebellion. 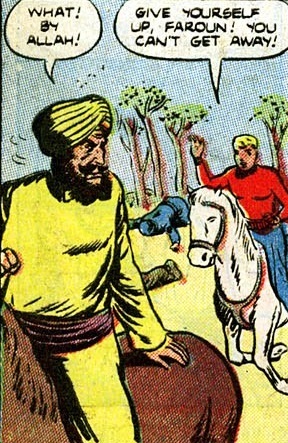 But after Willy and the four boys dealt with the henchmen, Bob chased after Faroun on one of their horses -- although Faroun fired his handgun at him, Bob bravely continued the chase. Faroun got to his plane and took flight, but not before Bob grabbed hold of the plane's undercarriage and climbed up to the wing-strut. 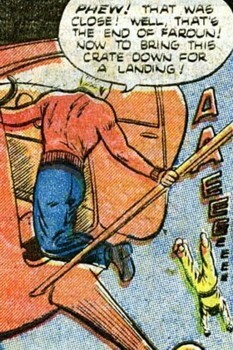 Seeing the teenager through the plane's window, Colonel Faroun opened the door and leaned out to slash at Bob with his sword, but he slipped out and plunged screaming to his death on the desert sands below (Fortunately, Bob also had piloting skills, and he safely landed the plane). Comments: Created by an unidentified writer and Carl Hubbell (artist). Numbering at least five, they were the loyal followers of Faroun and aided him in his attempt to overthrow King Iba-Taub. They kidnapped Bob Brant when they mistook him for Iba-Taub and carried him back to Faroun's fortress. When the rebellion crumbled, Faroun's henchmen accompanied him to Dervish Oasis, where Faroun had a plane waiting; Faroun ordered his henchmen to hide in the desert while he flew off to recruit more tribesmen for the rebellion. But the henchmen were knocked off of their horses and overwhelmed by Willy Wonder, Bob and the Trouble-Shooters (Bomber, Daffy, and Feathers used their yo-yos to stun three of the henchmen from behind). 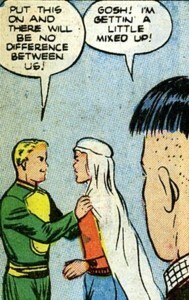 The blond-haired teenage ruler of Idnshar, his father had been the Arabic king, and his mother was an English woman. His mother died when he was born, and after the death of his father, young Iba-Taub ascended the throne and became king. But because of Iba-Taub's mixed heritage and his friendliness toward Western democracies, his great-uncle Colonel Faroun sought to have him dethroned so he could rule in his place. One day, Iba-Taub was in the bazaar looking over Willy Wonder's tractor when he encountered American teenager Bob Brant, and the two boys were startled by the remarkable resemblance they had with each other -- Iba-Taub even had Bob put on his burnous to demonstrate the similarity. But suddenly Iba-Taub's palace guards ran up to warn him that Faroun's henchmen were about to strike, so they took him to safety. Bob (still wearing Iba-Taub's burnous) was mistaken for the king and kidnapped by Faroun's men. 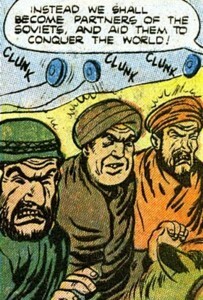 Iba-Taub would later lead his own men in a successful counter-attack on the rebel forces, while Bob Brant and the Trouble-Shooters, along with Willy Wonder, pursued Colonel Faroun. 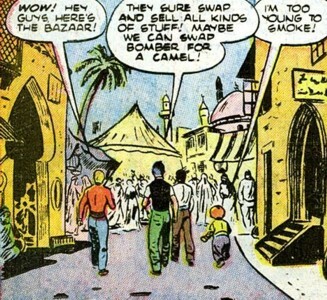 A small Middle Eastern desert kingdom in the vicinity of Egypt (Bob Brant and company passed the Sphinx on their flight over), it was ruled by the teenage King Iba-Taub. Some of the prominent locales included a trade bazaar, King Iba-Taub's palace, and Colonel Faroun's fortress. It was near the Dervish Oasis, where Colonel Faroun had a landing-strip for his private plane. 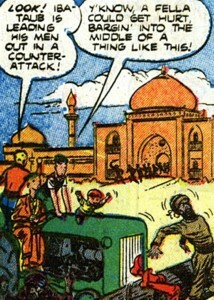 An American tractor salesman working in the Middle East, he found himself stranded in the tiny country of Idnshar when his company went out of business two months earlier. He hoped to sell a tractor and earn fare back home, but his only interested customer was the teenage King Iba-Taub. 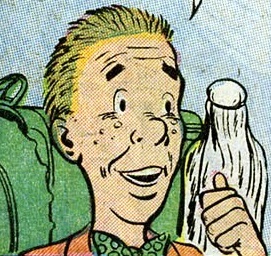 During an encounter with Bob Brant and the Trouble -Shooters, Willy noticed the uncanny resemblance between Bob and the young king. 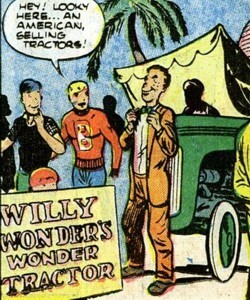 When Bob Brant was wrongfully abducted by rebels (who mistook him for Iba-Taub) and locked in a dungeon for execution, Willy used his tractor to assist the Trouble-Shooters in freeing Bob. He and the boys then tied a log to the front of the tractor and turned it into a battering-ram, which they used to clear the streets of rebel insurgents. 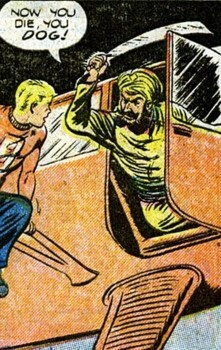 Willy later drove Bob and the Trouble-Shooters on his tractor to Dervish Oasis, where the rebel leader Colonel Faroun was making his getaway by plane.